Home / Featured / APGA......... THE LAST BUS STOP! APGA......... THE LAST BUS STOP! The events in the Nigerian political sphere these days stimulate a feeling of de javu. From the hounding of the Senate President, Bukola Saraki, to the threat of an upend of the All Progressives Congress majority in the Red Chamber due to the defection of lawmakers, one surmises the APC too might be heading for an implosion and subsequent disintegration like the Peoples Democratic Party , which began in 2013 and culminated in their loss of the 2015 presidential election. There is a definite slant to the APC losing the legislature – the overbearing power the party gains by running both the legislature and the judiciary can be counterbalanced by a strong and vibrant PDP opposition. The apparent reason one should not yet be excited by the prospect is that it makes not much difference in the long run; there is a yawning lack of ideological distinction between political parties in Nigeria. Virtually every lawmaker agrees on the same issue and for the same reasons. Their opinions – for those that have any – largely mirror one another and it is somewhat rare to see lawmakers take one another up in a fierce rhetorical contest of principled positions. Even the APC that once claimed to be progressive, seeing no further need to keep up the ethical pretence, long dropped the tag. Their administration is now barely distinguishable from the PDP at the zenith of its glory. The PDP, the political party that once thought of itself as the most formidable in Africa, disintegrated as soon as the centripetal force of the presidency that held all the incoherent and undesirable elements of the party was removed. The APC, not a more superior contraption either, is a band of Ali Baba’s men stapled together with the might of political power and the prebendal benefits it promises. If the APC loses power next year, they will crumble faster than the PDP did when their dirty hands were removed from the public till. It is even more worrisome that we are rejoicing because of this drama called defection. we should be sad and depressed because at the end, if PDP wins the 2019 elections, we will still be getting the same result because we are going to be dealing with the same persons. It is time we physically inject new ideas, ideologies and brains into our political space. A party with a good and practicable manisfesto should be allowed to pilot the affairsof Nigeria, and having thoroughly researched this notion, I am convinced that only the ALL PROGRESSIVE GRAND ALLIANCE (APGA) can make a positive difference! 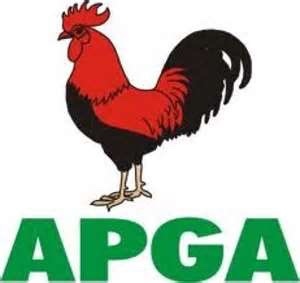 APGA is the only party in Nigeria today that represents the interest of the masses. It is time Nigerians do away with PDP and APC. The party is stable . APGA IS THE LAST BUS STOP!!! Emmanuel Chukwudi Elochukwu is write, this young man promotes the party so much i wish the governor and the party excos will encourage him. APGA indeed is the last bus stop...kudos to Uju and Elochukwu.